OK, I can’t really explain my strange obsession with schnitzel. I have no German or Austrian heritage, but lately this tasty little treat has made it into a fairly regular rotation in our household. Granted, breading and frying anything is usually a good idea, but lately I’ve been more interested in a cracker-encrusted pork loin escalope over something closer to the chicken or beef cotoletta of my Italian roots. But before I go on, a note to traditionalists: it’s not as though I haven’t consistently called a dish by the wrong name in the past, but technically it’s not wiener schnitzel that I’ve been making since I don’t use veal. That said: I’ve certainly seen and heard pork loin schnitzel called by that name, so call it what you will–and enjoy. Slice the pork loin into five 1/4 lb chops. 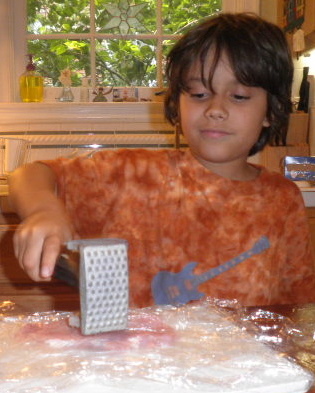 Place each chop between two sheets of plastic wrap and pound into escalopes with a mallet. Without question: this is Josh’s favorite part of the recipe. Set aside your escalopes while you prepare your dredge. Set up a dredging station with flour, beaten eggs, and crushed matzos. Often when I make cutlets, I do not add any salt or pepper to the egg. For this dish, I think it’s essential–I hit it with about 1/2 tsp of salt and a few grinds of black pepper. For the matzos, I crush them pretty well, but I definitely like to keep some of the cracker texture. Ideally, you will want a nice mix of finely pulverized matzo and bigger pieces. Dredge each escalope through the flour (knock off anything that doesn’t stick to the pork), then the egg, and finally the matzo crumbs. Let the breaded escalopes sit in the fridge for at least a half hour. When you are ready to fry, heat up a 1/4 inch of oil in a heavy bottom pan. If we were going for authentic, I’d be using lard. I have used a mix of butter and oil, but more often than not I just use canola oil. When your oil is hot, fry a couple of schnitzels at a time (don’t crowd the pan) to a golden brown. Transfer to paper towel and season with a pinch more of salt. 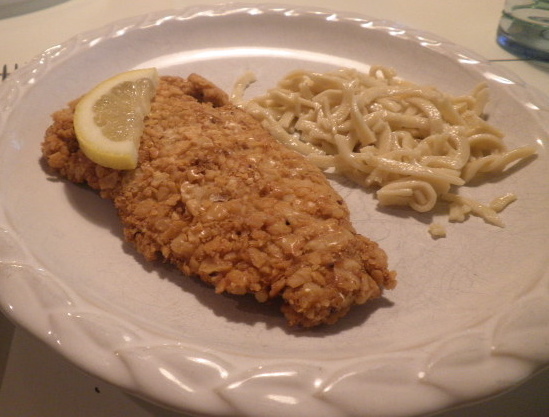 As you plate the schnitzel, garnish with a lemon slice. The lemon really is essential–a little wipe of a lemon slice really brings out the flavor. In the past I have usually served this dish with mashed potatoes, but last night I used dumpling noodles as a side, tossed in butter. I’m now sold on it as the perfect side. For a veg: cabbage sauteed with bacon, pickled green beans, and broccoli have all made guest appearances at one time or another. On this night, it was simple green salad. This entry was posted in Uncategorized and tagged comfort food, cutlets, dinner, pork loin. Bookmark the permalink. Sounds delicious! And I know that shirt that Josh is wearing in the picture!!! We miss you guys! I’m looking forward to cooking for you in a few more weeks!